I haven’t posted recently due to some medical issues, but I’m itching to get back into things now! There is a series of video games called “Fallout” set in a post-apocalyptic future, where the tech is based on 1950s style things, but often with a humorous twist. One of the key features is that some people survived the nuclear war in special “Vaults” (made by Vault-Tec). 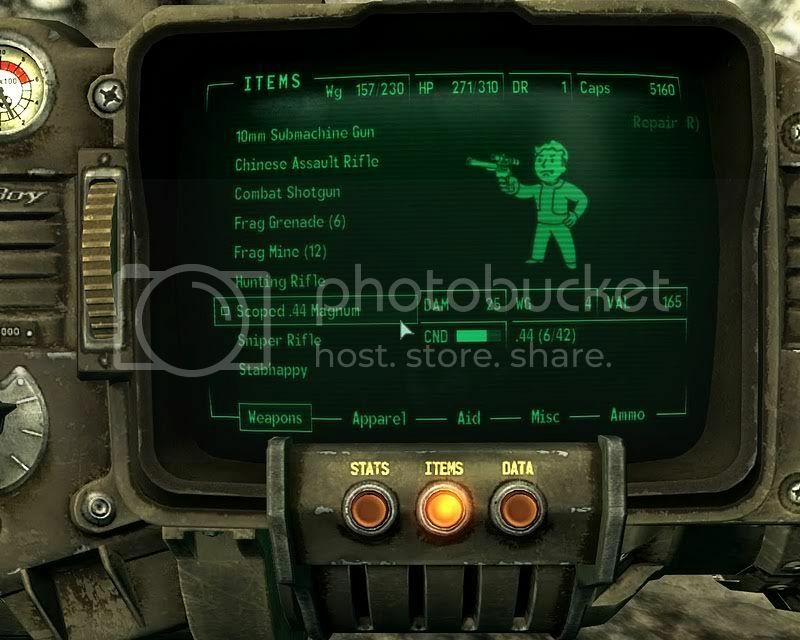 Each Vault member (called “Vault Dwellers”) wore a wrist computer called a “Pip-Boy” — it had a GPS, stats, giger counter, etc, etc. Several people have made them for cosplay, either with an entirely fake screen or using looped video on an ipod Touch. I know that with an Arduino I could control a real usable screen, so that’s the goal! Screen that works and is programmable! As stuff arrives, I’ll detail it! I grabbed an over-priced RGB LED from Radio Shack (its a Red, Green, and Blue LED in a single package) for a possible project. Using the Arduino and PWM stuff I’d learned, its easy to make the RGB LED “Crossfade” through all the possible combinations of Red/Green/Blue. Electroluminescent (EL) wire (I got it off ebay for $7 for 7.5 feet, shipped from China) – nifty wire that is flexible and glows! Now the waiting for all the shipping begins! Lighting an LED is easy: power and a resistor so you don’t blow out the LED. Apparently making that LED do something else, like fade in and out, takes something more, like an Arduino microprocessor that supports Pulse Width Modulation (PWM). PWM is basically a method of turning the power on and off rapidly, so the LED in this case appears to fade in and out, or pulse. If you looked at it with a high speed camera, it’d be flashing on and off, each time it came on a bit dimmer. Since this is happening faster than the human eye can detect, it looks like its just fading. Hurray! I’ve accomplished something a 10 year old can do! But it was fun…and I’ll do more!